The Socialist Popular Alliance Party has announced it will back Hamdeen Sabbahi in the upcoming presidential election. Ninety percent of members backed the move at a party meeting on Friday, Secretary-General Talaat Fahmy told Ahram Online. "We will be part of his campaign and participate in writing his electoral programme," said Fahmy. He stressed the party had always wanted to see a competitive election, not a referendum on one candidate – a reference to former army chief Abdel-Fattah El-Sisi. Fahmy said the party was backing Sabahi because of his political background. "Sabahi was always part of the Nasserist camp. He always stands behind the workers and the poor." Sabahi would work to fulfil the demands of the January 2011 revolution and support marginalised people, he added. Sabahi's Karama Party and Egyptian Popular Current, and the liberal Constitution Party, have also said they will support Sabahi's campaign. The Socialist Popular Alliance Party is a leftist party formed shortly after the Egyptian revolution of 2011. The presidential poll, the first to be held after the ouster of Islamist president Mohamed Morsi last July, is scheduled to take place on 26-27 May. Abdel-Fattah El-Sisi and Hamdeen Sabahi are the only candidates. 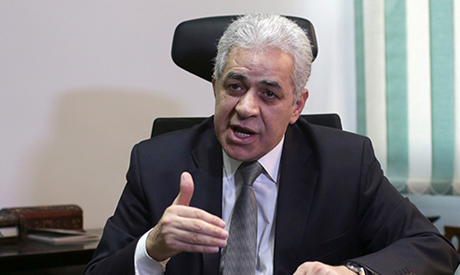 Sabahi's campaign said it gathered 31,000 notarised recommendation forms across 17 governorates – 6,000 more than the 25,000 necessary to register as a candidate. El-Sisi's campaign claimed to have collected 400,000 recommendations. They submitted 200,000 forms from 27 governorates with the election committee. The election committee will announce a final list of candidates on 2 May and give the green light for election campaigns to take place between 3 and 23 May.